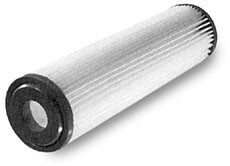 The new and improved activated carbon cartridge filter from Filter Cor Inc., of Sun Valley, Calif., is constructed of carbon via a wet-molded production process using a blend of powdered and granulated coconut shell activated carbon with an incorporated fiber binder. Five-micron pre-filtration removes solid particles and protects the inner carbon powder pores from being spent prematurely. The sulfur-free carbon blend has a high service area to provide increased carbon treatment capacity.